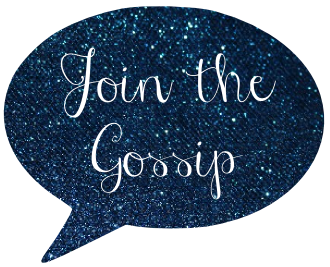 Join The Gossip: Fruity Fashion? Today's Friday's Fancies was all about creating an outfit around our favorite summer treat. For me, when I think summer, I think watermelon. So that's what I created my outfit around! Would you wear this? I totally wish I was out and about in these adorable clothes and accessories (all available online now at H&M and BaubleBar!) BUT I am still sick. It's day 11 and I'm in so much pain with a non-stop cough. Boo! This weekend I am having an early birthday celebration so please send me your good vibes. I can't miss my own party! On the sick note: I'm sorry if I haven't visited your blog. I feel really bad about it but just haven't had the energy. I promise I will get back to your blogs eventually!! 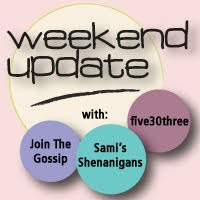 Don't forget to come back Sunday night/Monday and linkup for Weekend Update! Those shorts are *awesome* I need them! The your outfit! I love summer time treats as well! BRILLIANT. I love how you interpreted this inspiration! Love watermelon!! Love those hot pink shorts! I'd totally wear this outfit. So sorry to hear you're still sick...yuck!! Happy early birthday!! Mine is today (Friday). I didn't realize ours were so close. I hope you feel AWESOME for your party and you can celebrate big!! Happy weekend! So cute! I loooooove watermelon. You'd look adorable in this outfit. :) I'm so sorry you're still sick! You get sick way too much, ugh. I hope you feel better soon so you can get back to fun stuff like sailing, fancy LA events, and dinner/drinks out! I love the inspiration! Watermelon is so great for summer! Fruity Fashion made me laugh!! Love the combo though. I'm liking that short, I need that color in my wardrobe. I was waiting to see if someone used watermelon as inspiration. I love the pink / green color combo and you can never go wrong with Bauble Bar accessories. very cute! So many people chose watermelon...now I'm hungry! Ahhh I love the watermelon inspiration! I went with a more ombre twist, but I love the accessories you chose! so cute! I love the little green triangles on the necklace, very watermelon like! Adorable! Especially love those shorts! Hope you feel better soon. I would TOTALLY wear this! I love everything. Please feel better soon! I need you next weekend! your little flow chart made me laugh :) I love the color of those shorts. Watermelon is the BEST summer snack! Love what you put together. I love those shorts! Hope you are feeling better! This is SUCH a cute idea! hmmm My favorite summer time treat is HotDogs... I wonder how that would turn out... haha! VERY cute outfit! I want those shorts! And the green accessories would look great with it! Watermelon was my inspiration behind this week's look, too! I LOVE those shorts and need them in my closet! Great choices! Hope you have a great weekend! This outfit is a fave for me and I wish H&M would let me order online!! Sorry you're still sick--sending good vibes!! So cute! I love the colors. I'm obsessed with all shades of green lately. I can't believe that you are STILL sick! Don't worry about all of us, just take care of yourself. As for the outfit, I LOVE it! It is perfect for summer and sooo fun! I just read this and got to the end and it about broke my heart - feel better pretty girl! I hate that bad things happen to good people & I'm sending you as much healthy juju as I'm capable of. Also, gggggggreat inspiration ;) I may-or-may-not-have chosen watermelon, too! CUTE!! I was so excited about this week's Friday's Fancies theme, but my week flew by and I never created an outfit. I love the one you created! Alright Now! !...Go 'head and rock those blue tips.